It’s unofficial review week here at FiscalGeek and I’m happy to be a stop on the book tour for the newly released Living Well With Bad Credit by Chris Balish and Geoff Williams. I was intrigued to learn what they might suggest for those wading their way through the FICO wasteland and was pleasantly surprised to see some very practical tips and advice for the credit challenged. 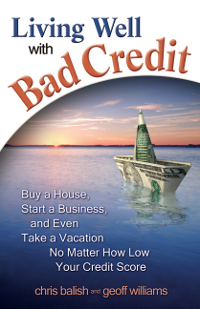 The book advertises that you can buy a house, start a business and even take a vacation no matter how low your credit score. Sounds great let’s get to it. The book opens with the authors explaining their particular backgrounds and Geoff explains that he is a personal finance writer who had to declare bankruptcy. I very much appreciate the transparency and because of his experience you know that he’s got some real insight to share. What I appreciate most about this book is that it’s full of practical tips that are not magical nor do they require you to sign up for some sketchy program. They are legitimate steps you can take with a variety of alternative options to conquer some common problems you’ll encounter with bad credit scores. I especially enjoyed the suggestion to live in a Yurt as an option to purchasing a house. If you don’t know what a Yurt is check out Pacific Yurts and you’ll see how awesome they are. My credit is fine and I’d love to live in a Yurt somewhere beautiful. We stay in them on vacation frequently. You’ll also fine practical tips on what to do about vehicles, housing, vacation all of those things that you might assume you need a credit card or good credit to participate. In that respect this might be an excellent book for people trying to avoid using credit altogether regardless of credit score. Living Well with Bad Credit is for those dealing with a bankruptcy or a terrible credit score for a variety of reasons. There are plenty of tips for most any situation that you might be coping with. I understand that you might not have much spare cash if you happen to be in that scenario but this might be money well spent to help you plan your way back out. If you’ve got no issues with your credit score then you probably should take a pass. This is written for a target audience to be sure. My only real gripe with the book is the somewhat awkward exchanges that occur throughout the book between the two authors. No doubt having two different voices within the same book has to be challenging to merge. The information is solid, the humor is at times painful. Sorry guys. What’s a Good Credit Score? Should you Care? Stop Obsessing on Your Credit Score! What is a Good Credit Score? Should you Care? The painful humor comment made me laugh! Maybe bad credit really isn’t funny, huh?? Thanks so much for an excellent review. We really appreciate all the time you put into reading and reviewing this book. I hope your readers will find the information useful. Thanks again! .-= Lisa´s last blog ..Karen White, author of On Folly Beach, on tour May 2010 =-. I only know one couple who fall into the target audience for this book. She declared bankruptcy last year and he did a few years ago. Alas, I don’t think that they need much advise on how to live well. They got more and bigger TVs than I do, they have new furniture for the new house which they are renting, and their cars are bigger, too. When I look too closely I wonder what the heck I am doing wrong. On second thoughts, maybe I should get the book to get enlightened. Next post: The Secret to Success. Hustle.